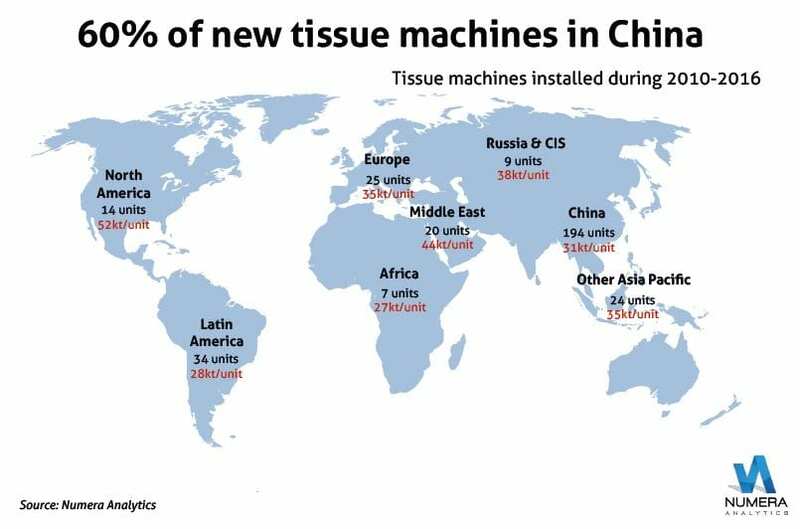 With tissue consumption growing at a rapid pace in emerging markets, particularly in China, an unprecedented number of new tissue paper machines have been installed. 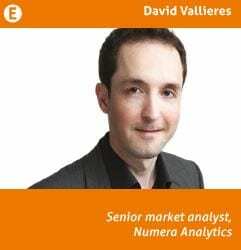 Numera’s analysis shows that 327 new tissue paper machines with an annual capacity of 10,000 tonnes or higher have started up since 2010, adding approximately 11 million tonnes of new supply. By comparison, global suppliers added 188 new tissue machines in the preceding seven-year period (2003-2009), or 5.5 million tonnes. Not surprisingly, nearly 60% of these new machines (194 units) are located in China. Together they have added 6.0 million tonnes of supply to the Chinese market where over the period 2010-2016 tissue consumption has expanded 8% per year. in Latin America where 34 new units are located. Overall, 89% of the machines, accounting for 86% of the new supply globally, are in the emerging markets. In the developed markets, most of the investments were in Western Europe (13 units) and North America (14 units). Of the 325 new tissue paper machines, the average machine capacity rose 20% to 34,000tpy from the years 2003-2009. Moreover, one-third of the new machines had an annual capacity greater than 40,000 tonnes. In North America and Western Europe, more than half of the newly installed units had an annual capacity greater than 40,000 tonnes. The average annual machine capacity in China was 33,000 tonnes, up from an average of just 21,000 tonnes during 2003-2009. It’s in North America that the largest machines have been built. Over the past seven years, the average capacity of new PMs was 52,000 tonnes, more than 50% larger than the global average. Of those, half have TAD technology. Machines have also been above the global average in the Middle East, at 44,000 tonnes. A few large machinery vendors dominate the market for new tissue machines. 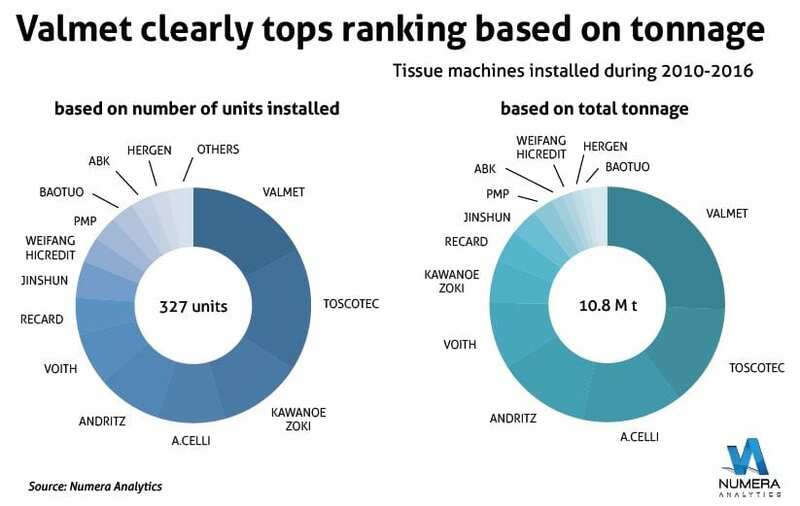 Numera estimates that Italian supplier Toscotec and Finnish company Valmet both had a 17% share of the newly installed tissue machines. The next three vendors, Kawanoe Zoki, Andritz and A.Celli, had a combined 30% share of new machines, meaning the five largest machinery vendors accounted for close to two-thirds of all new tissue machines. A different picture emerges when viewed by average machine capacity. Valmet’s machines had an average capacity of 51,000 tonnes per unit while Toscotec’s average capacity was 28,000 tonnes, or about half the size. Similarly, Andritz and A.Celli had an average machine size well above the global average, at approximately 50,000 tonnes, while Kawanoe Zoki units averaged just 17,000 tonnes. So measured in terms of installed capacity over the period 2010-16, Valmet occupies the top position with 26%, well ahead of Toscotec, A. Celli and Andritz which are close together, each with a share of 13-14%. Surprisingly, even after this period of very rapid growth, tissue capacity is expected to continue to expand about 5% per year during 2017 and 2018, which represents an additional four million tonnes of capacity in just two years. Future projects shows 70 new machines announced for 2017 and 2018, which would mean 35 PMs per year, down from 47 per year during 2010-2016. However, the average machine size is continuing to expand. The average capacity of PMs scheduled to enter production in 2017-18 is 44 000 tonnes per year, which would represent an increase of 30% over the machines installed during the 2010- 16 period. Share the post "Unprecedented number of tissue machines installed since 2010"